Sonali Bank Limited has invited application for the post of Senior Officer, Officer and Officer Cash from qualified candidates. 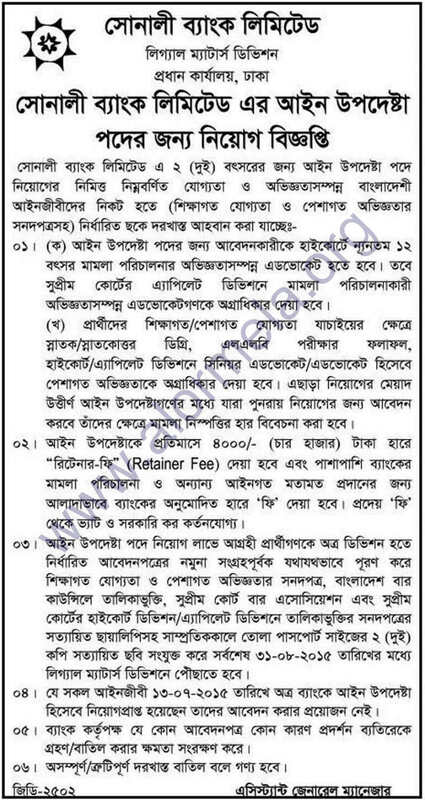 The huge number of vacancy circular has been published by Sonali Bank under Bangladesh Bank. Total posts of Senior Officer-701, Officer-820 and Officer Cash- 755. Candidates must have Graduation/Posts Garduation degree. Interested applicants have to apply through Bangladesh bank website or below online by following guideline. Senior Officer : 25 Feb to 19 March 2016. Officer : 03 March to 26 March 2016. Officer Cash: 10 March to 02 April 2016. Sonali Bank recruitment are availble here. Applicants are adviced to keep a hard copy of their application for future referance. Written and Viva test date will be notified by mobile SMS, website and daily news paper. Detail Circular is given below as pdf file. Previous Circular: Assistant Engineer (IT), Assistant Programmer, Assistant Database Administrator, Assistant Engineer (Civil, Electrical, Mechanical, Architect & Textile), Sub-Assistant Engineer (Civil, Electrical & Architect), Senior Officer (IT) and Officer (IT). Candidates must have Posts Garduation degree or 4 years Graduation degree in Computer science and Engineering/Electrical/Electronic Engineering/Telecommunication Engineering/Information Technology/ Applied Physics/Math/Applied Math/Statistics. It was great jobs offer in Bangladesh. Thank you to creating that content. How to collect my Sonali bank applicant's copy.